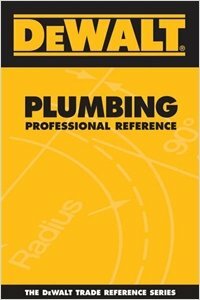 The DEWALT® Plumbing Professional Reference is an essential resource for anyone working with plumbing systems. It covers everything users need to calculate water demand, find installation requirements, size pipes, size pumps, design drainage systems, and much more. Helpful troubleshooting guides, charts, tables, and graphs assist visually oriented users in getting the job done right the first time. conveniently fits into any pocket or toolbox for the ideal carry-along!